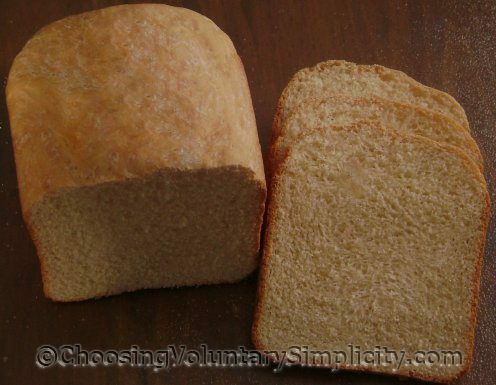 This recipe started with a recipe from the booklet that came with our Breadman bread maker. I like it because it’s an uncomplicated recipe that always makes a great loaf of bread and doesn’t need “supervision.” I do check the dough ball at the beginning of the mixing cycle and add water if necessary… usually less than a tablespoon… but that varies from day to day. I add all the ingredients in the order listed and use the basic program with the light crust setting. This recipe makes a two-pound loaf. I tried this recipe just after I saw this post and it made the best bread I have ever made. That hint about the orange juice is amazing and I did do the egg and the white whole wheat flour just like you do. My family thanks you for another great recipe. I think I have made all of your recipes and they’re all great. I can’t wait to try this one. Just wanted to tell you that you have made me a much better cook than I was before I found your blog. Looks good! I’ll try it. Just made this recipe last night; made it with just water instead of orange juice and an egg. It didn’t rise near as much as I had expected, but it tasted wonderful. This is the first bread I’ve made with white whole wheat flour and it added hearty flavor without being overpowering. Will definitely make this again, thank you for the recipe! I googled a white whole wheat flour recipe, and came across your page. What a wonderful recipe! I used almond milk instead of water, and honey instead of sugar. My loaf came out soft and huge compared to my previous loaves (just started making our own bread a few months ago). Thank you sooo much! Also, I appreciate your other posts. We are working on simplifying our lives, and these posts were encouraging.